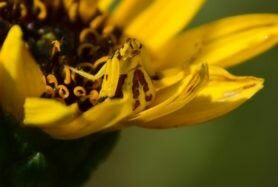 The spider species Misumenoides formosipes, commonly known as White-banded Crab Spider, belongs to the genus Misumenoides, in the family Thomisidae. Misumenoides formosipes spiders have been sighted 16 times by contributing members. Based on collected data, the geographic range for Misumenoides formosipes includes 1 countries and 11 states in the United States. Misumenoides formosipes is most often sighted outdoors, and during the month of August. 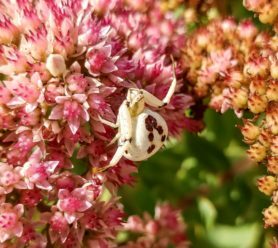 There have been 16 confirmed sightings of Misumenoides formosipes (White-banded Crab Spider), with the most recent sighting submitted on October 15, 2018 by Spider ID member mumsy. The detailed statistics below may not utilize the complete dataset of 16 sightings because of certain Misumenoides formosipes sightings reporting incomplete data. Environment: Misumenoides formosipes has been sighted 3 times outdoors, and 1 times indoors. 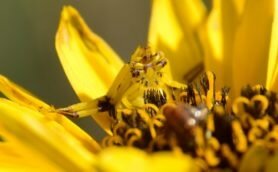 Misumenoides formosipes (White-banded Crab Spider) has been sighted in the following countries: United States. Misumenoides formosipes has also been sighted in the following states: California, Illinois, Kansas, Kentucky, Massachusetts, Michigan, Nebraska, Ohio, Oklahoma, Tennessee, Wisconsin. Misumenoides formosipes has been primarily sighted during the month of August. Species is quite variable in color and pattern. In females, the base color of the body is usually yellow, white, or light brown. The abdomen may be with or without red, brown, or black markings and it is widest at the posterior (back) end, appearing as a rounded triangle shape from above. Also somewhat flattened in a side view. Adult males are very different than the females. 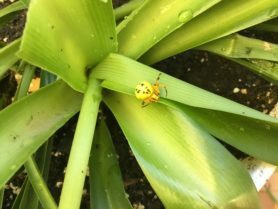 They’re much smaller, only about 1/4 to 1/3 the size of the female, and come in shiny red, yellow, and/or green coloration. 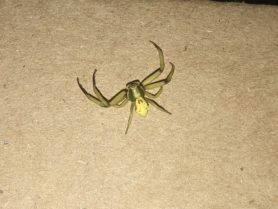 Their front legs are dark (usually black) and the rear legs green or yellow. 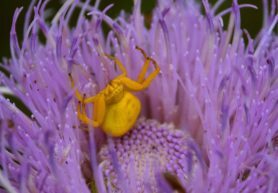 A view of the eyes from the front can help distinguish this species from the similar looking “Goldenrod crab spider” (Misumena vatia). 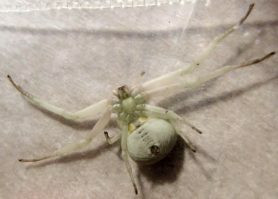 In the “Whitebanded crab spider,” there is a conspicuous, white, transverse ridge below the bottom row of eyes called a “clypeal carina.” Misumena vatia does not have such a ridge. 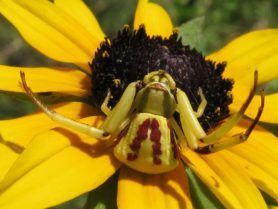 This species is one of the few spiders in North America that are capable of actively changing their body color from yellow to white, or vice versa, depending on the flower they are perched on. They do this by transferring a liquid, pigmented material to the cuticle. The color change is not instantaneous; it can take anywhere from three to nine days to complete (G. N. Dodson, pers. comm., June 2014). 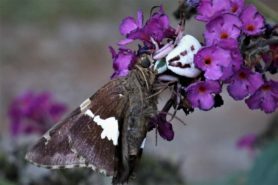 Because they usually live on flowers, the majority of their diet includes pollinators (e.g. bumblebees, honeybees, butterflies, moths, syrphid flies, etc). Males often feed on pollen to fuel themselves during their quest for a mate. Egg sac is deposited among foliage and is a silken white, lens-shaped “package,” about 10-14mm in diameter, and containing anywhere from 80-180 tan-colored eggs. Female stands guard over it until she dies.